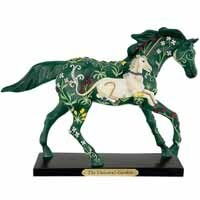 Unicorn's Garden | Retired Ponies Figurines | One Price Low Flat Shipping! From the Trail of Painted Ponies Collection, Unicorn's Garden. Designed by artist, Jennifer MacNeill-Traylor. Made of hand-painted resin. Measures 6.5" tall.